Speed and Power – When you’re out looking for a meat slicer, you definitely don’t want to skip out on speed and power. Basically, long story short, the power of the motor will determine how long you will be able to slice the food for. If you have a slicer with a little power, it will become overheated, causing you to have to take a break so that it can cool down. If you plan on slicing a lot at one time, then speed and power shouldn’t be ignored. Durability – I wouldn’t want to purchase a meat slicer only for it to last a couple of months – that would be a major disappointment. You need to find one that is guaranteed to last a long period of time. Mind you, going for one just because it has a higher price tag isn’t going to make it last longer – it is important that you take a look at the material of the models, as well as the customer feedback. Take note that metal parts, obviously, have a tendency to last longer than those plastic parts. Size – When it comes to the size of the meat slicer, there is one important factor you need to take into consideration. The counter space – do you have a lot of room on your counter? If you don’t have anywhere to put your slicer, then that’s no good. If you have limited space and only plan on bringing it out when you want to use it, then you need to take the weight into consideration. Ease of Use – You want a food slicer so that slicing food will be easier, so you don’t want to look away from the ease of use. For example, the higher powered models will allow you to do almost all of the slicing you need without having to take a break. If you go for a meat slicer that has a tiny carriage, then you may need to trim the food before you use the machine, which will add more work. When it comes to choosing your meat slicers, you will have two types to choose from – manual and electric. The type you choose all depends on your personal preferences. Manual Slicer – If you choose to use a manual slicer (hey, there’s nothing wrong with putting a little bit of elbow grease into your work from time to time), you’ll need to manually move the food in order to slice it. For this reason, you’ll require to put more work into your job, and they are slower to use than the electric machines. If you plan on slicing a lot of food, then the manual slicer isn’t that great of an idea. Manual meat slicers used to be popular for meat slicing, but since the introduction of the electric meat slicers, they’re not as common. However, there are still some people out there that prefer the manual slicers because they have more control and feel the meat slices come out with a better texture than they would if they were to use the electric models. 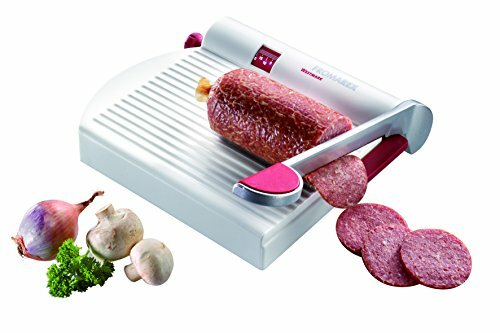 Electric Meat Slicer – These are easy to use and are the most popular option. Since they are electric, they will do almost all of the work for you. These machines have a motor and will move the carriage for you, so you won’t have to push the meat by hand. Basically, all you have to do is put the meat (or whatever food you plan on slicing) on the machine and turn it on. Aluminum and Stainless Steel construction. 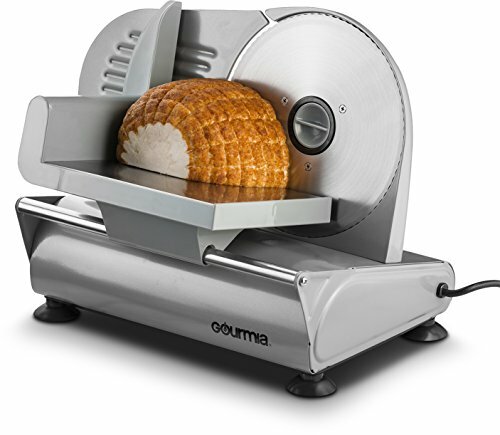 Solidly built and a high quality slicer. Inexpensive, and high quality. Slices meat and cheese perfectly. Custom slicing blade. Built for the toughest home slicing needs. After doing a lot of research, I came to the conclusion that the most popular home meat slicer would have to be Chef’s Choice 6150000 Food Slicer. It is more than likely the most popular home meat slicer due to the fact that it is one of the most affordable high-performance meat slicers you can find on the market right now. The components are made of cast aluminum and stainless steel, including the metal pusher. 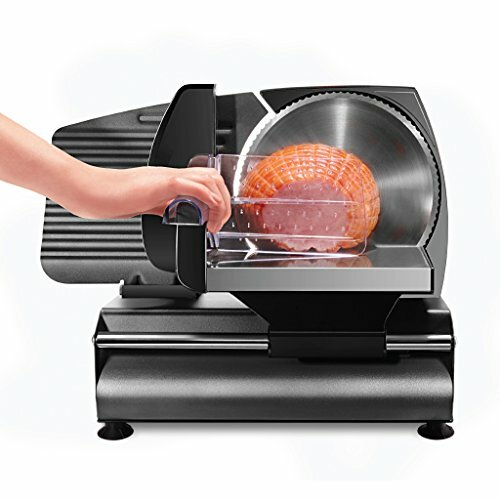 I personally like the tilted food carriage, which makes for efficient and quick slicing and the multipurpose stainless steel blade is exactly what I’d expect to see on a home meat slicer. Then you have the super powerful high torque motor with gear drive – that is exactly what is needed. If you’re looking for a machine that offers precision slice thickness control slices, then this one right here would be a great choice. It offers everything from deli-thin (that’s my favorite) to meat that is 3/5” thick. 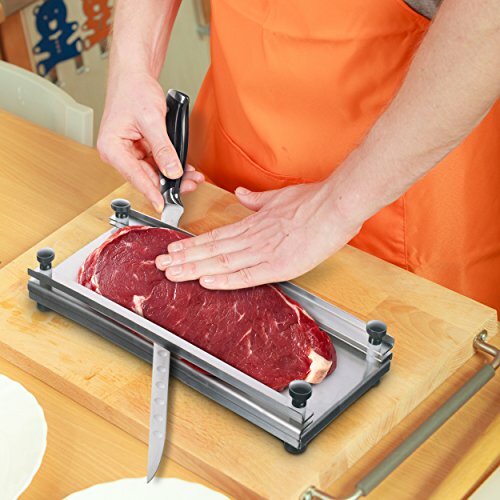 With this meat slicer, as an additional bonus, a serving tray is included. If you simply want to cut up cheeses, deli-sliced meats and a variety of other foods, then this heavy-duty 8.7-inch stainless steel electric food slicer from Valley Sportsman will have you covered. This slicer comes to you at a super affordable price and from what I have read, it’s pretty handy. Regardless of what you plan on making, whether it’s super-thin deli meat or thick slices (it can do up to 9/16 inches), this machine right here will be by your side. 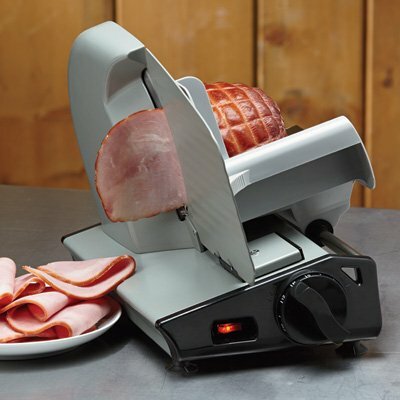 Sure, you could always continue going to the grocery store and purchasing pre-sliced meat, but personally, I believe it would be best to buy a larger portion and slice it up yourself – this machine makes it all possible. This is a versatile slicer that is easy to clean, has a removable stainless steel carriage cover, a side adjustment system and non-slip feet. If you don’t mind a little extra work, there’s no reason you couldn’t use a manual meat slicer. In fact, some people actually prefer the manual meat slicer over the electric ones. However, when you go for a manual meat slicer (or any meat slicer for that matter), you need to make sure you’re making the right decision because you could end up buying one that isn’t as good as it’s made out to be. It’s okay because I did the research for you and managed to find the best cheapest manual meat slicer, the Westmark Germany Multipurpose Stainless Steel Cheese and Food Slicer – it even has a board and adjustable thickness dial. This particular slicer is made in Germany out of high-quality material – in fact, many places have rated Westmark Germany as being one of the best kitchenware brands on the market today, and that is what caught my attention. As for the material, this slicer is made of stainless steel and cast aluminum. The handle is cast aluminum, while the blade is stainless steel. ABS with a polypropylene adjustable scale makes up the base. This machine is easy to use and it is capable of slicing both soft and hard cheeses, as well as other foods like sausages, cucumbers, peppers, radishes, and more. The ergonomic handle and thickness adjustable scale makes it even more comfortable. If you’re a jerky fanatic that is looking for the best meat slicer for jerky, then I have you covered in that aspect as well! With the Shop-Ezy stainless steel jerky maker cutting board, you will be able to make the perfect jerky each and every time. Regardless of the jerky, whether it’s deer jerky, beef jerky, or any other type of jerky, in order for it to dry properly and be safe to eat, it needs to be sliced uniformly and this slicer is capable of it all. The 10” razor sharp carving knife is equipped with a dimpled blade makes for precise cutting abilities and easy food release. The jerky board is stainless steel and will make slicing the jerky a breeze. You can also use this for cutting fruits and other items that you wish to cut before you place them in a dehydrator. It even comes fully equipped with Nylon spacers, which make it easy to adjust the cutting thicken 1/8 of an inch at a time. The cut thickness includes 1/8, ¼ and 3/8. Okay, so you want to slice meat like a pro, right? Of course you do, or you wouldn’t be reading these reviews right now. With this Chefman die-cast electric deli/food slicer, not only will you be slicing like a pro, but you will also be saving space. This meat slicer has a nice, sleek design to it that is very compact. To be exact, it measures 9” 12”, making it small enough to fit on countertops, and in most cabinets. This is a good meat slicer that would come in handy for a home or restaurant chef. You can use it to make delicious deli sandwiches, homemade beef jerky, and so much more. This is a powerful 180 Watt AC motor that makes it quick and easy to slice ham, turkey, deli meats, bread, cheeses, fruits and vegetables. It has an adjustable thickness dial, which can be used for customizing the thickness of your slices just the way you like it. While doing my research on the Chefman meat slicer, I also noticed many people saying how easy it is to clean (this is something I always look for in kitchen products). It has a removable and retractable 7.5” serrated stainless steel blade and the die-cast aluminum housing isn’t going to give you any hassles when it comes to cleaning it. There are numerous safety features that you should know about. Starting out, it has sturdy non-slip feet, a food pusher to make sure the slicer will stay in place so that you can keep a firm grip, a blade safety guard and an on/off switch so that you can cut safely. This is a good meat slicer with plenty of safety features (something you should look for in your meat slicers) and the fact that it is compact makes it even better. I especially like how it has an adjustable thickness dial so that you can customize the thickness. If you’re in need of a meat slicer that will do the work for you, then I would recommend The CounterMan. It has a unique design and construction features that will make slicing your food a whole lot easier. 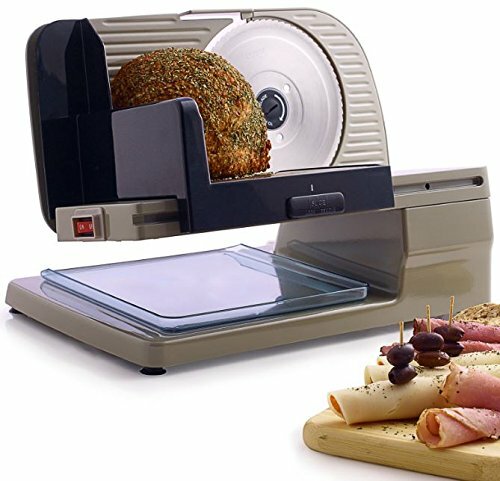 This machine is capable of helping you achieve those perfectly thin delicate slices of meat as well as bread, and cheese. There are universal slice features on this device, so you can customize your blade. The MicroSlice controls will allow you to slice however you want. There’s also a built-in thickness knob, which will allow you to adjust from super thing to approximately ¾” thick. Using this machine is safe and easy. There’s a suction grip located on the bottom of the machine, so you won’t have to worry about it slipping around your counter while you’re using it. The blade and food holder remove, so you can easily clean it. This is a heavy duty machine that was designed with a nice, spacious sliding food carriage, and die-cast aluminum housing. If you’re looking for a handy meat slicer that is capable of slicing meat, cheese, bread and other types of food, then this one right here might just be a suitable option for you – it really does have everything you need in a meat slicer. In the end, whether you choose a manual meat slicer or an electric meat slicer, if you choose one from the list I just gave you, you can rest with the satisfaction of knowing you’re making the right choice.